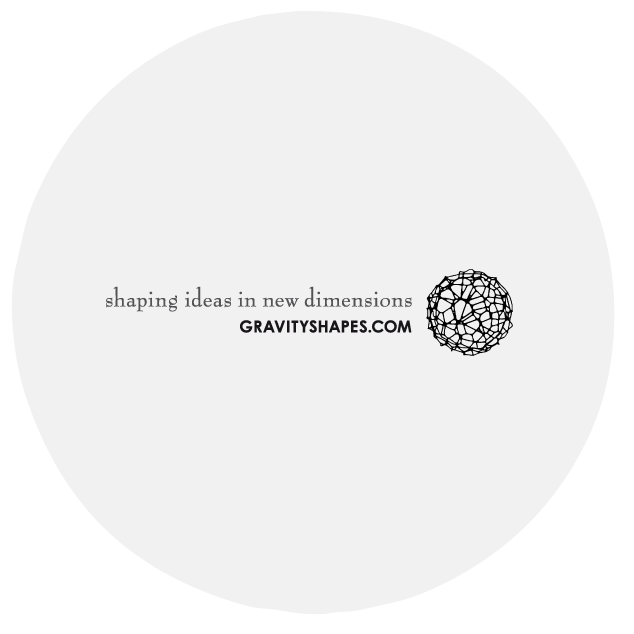 GRAVITYSHAPES means bringing ideas, materials and forms into new dimensions. As a skilled graphic designer, the young Swiss designer Stefan Hertach has been experimenting with various software, scanners, 3D printers and materials in the 3D area since the spring of 2016, and shapes his ideas into new dimensions. It quickly became apparent that the creative 3D design objects, which were conceived and printed for the private benefit, also attract great enthusiasm internationally. After only a few weeks, first inquiries were made to selected designer pieces for exclusive designer luxury collections in France and United Kingdom. Other cooperation requests e.g. from the USA, Italy, China and Philippines showed the strong interest in the first 3D objects. Since early January 2017, the young designer has therefore published his works under the name GRAVITYSHAPES, in order to make them accessible to more people. His design objects were featured in various print media (including “3D Make & Print”, published 2017 in the UK and USA) or exhibited at the “dutch design week” 2017, the largest Northern European design exhibition. After the first development of a porcelain collection at the end of 2016, an extensive new wood collection with over 200 different 3D printed decorative and gift objects followed at the end of 2017, which is available in various shops and retail outlets. Without having to focus on a specific topic, the independent young designer from Switzerland has the freedom and the opportunity to implement his constantly new ideas in new dimensions. He designs his ideas from useful everyday objects, luxurious accessories to extraordinary decorations and realizes them on his own professional 3D printer. The best of his creations are subsequently made on order and in individual pieces at selected external high-tech 3D printing companies, or also printed in his own production, and are sold via national and international partners and online shops. The growing network of partners ensures that the 3D design pieces will find a place in more and more households and businesses, and that the topic of 3D printing will also spread. The young Swiss designer prefers to experiment with natural materials such as wood, metals, sandstone, porcelain or purely biologically produced and biodegradable materials, as well as with organic and functional shapes. Always in search of new interesting filaments (printing material), colors and shapes, he is constantly exploring the new possibilities and limitations of 3D printing. As supporter of an open society, of common goods, creative commons and open source, the designer provides selected GRAVITYSHAPES objects as STL print data for private, non-commercial use. The designs can be downloaded as free or paid 3D print objects models e.g. in the GRAVITYSHAPES online shop. In the first half year after the publication of the first 3D print object, GRAVITYSHAPES has already recorded over 15,000 downloads and by the end of 2017 the number had already risen to over 55,000. Some of the objects available for download may not only be printed out on their own 3D printer for non-commercial purposes, but may also be further developed and modified as required. Thus, shapes of GRAVITYSHAPES inspire new objects from other designers. Statistical data only from selected external sites such as Thingiverse, cgtrader and Pinshape, which provide corresponding statistics. Updated December 2017. Visit the GRAVITYSHAPES Shop now!